How has Singapore become the second-most food secure country in the world? In many parts of the world, food security is emerging as a serious threat. Increasing population, land and water constraints, changes in dietary habits with increasing affluence, the impact on global food production of floods and droughts in major food producing areas, falling food exports, and a rising number of importing countries – all are contributing to these uncertainties. The problem is likely to be compounded in the future by climate change. In the years to come, food security in most countries will become more complex than ever. For Singapore, among the world’s most open economies and one that is highly dependent on international trade, the situation is likely to be even more complex. The city-state’s volume of external trade is about 3.5 times its annual gross domestic product. A decline in the economies of its major trading partners is therefore likely to have an impact on Singapore’s own economy, including its food security. Economist Intelligence Unit recently ranked Singapore as the second-most food secure country in the world, behind only the United States. The Unit’s Global Food Security Index is based on three factors, affordability, availability, and quality and safety. Singapore ranks 1st, 11th and 13th on these three criteria, respectively. That puts it ahead of major food-producing countries like Malaysia (34), Brazil (36) and Australia (9). This achievement is largely attributable to the Agri-Food and Veterinary Authority (AVA), and comes despite a heavy dependency on food imports. At present, Singapore imports almost 90 percent of its food, and less than 1 percent of its land area is used for agriculture. Through its Food Security Roadmap, AVA has diversified sources of food and optimization of local production. These policies, especially those that seek to diversify the source of food imports, are important as they help to spread the risks associated with Singapore’s high levels of food imports. The Sino-Singapore food zone established in Jilin Province, China, in 2010, is just one example of food diversification efforts. The Jilin food zone has been designed as a foot-and-mouth disease-free-zone so that it can be an important source of pork. Not without its challenges, it is meant to enhance the city-state’s food security. This will provide further resilience against food supply disruptions. AVA has also ensured increased local food production over time through the provision of the Food Fund. Investments in new farming techniques such as hydroponics have contributed to a 30 percent increase in local vegetable production over the past 10 years. By the end of 2014, some 40 percent of local farms had benefited from this Fund. Singapore’s net imports for food, beverages and alcohol (clustered in one group) are quite high, at approximately S$15.57 billion ($10.9 billion) in 2014. Some of Singapore’s most important trade partners, like the United States and Australia, place great importance on the city-state’s retail food market. The U.S. sees Singapore as diverse, dynamic, highly developed, extremely competitive, and very strict with its sanitary requirements. 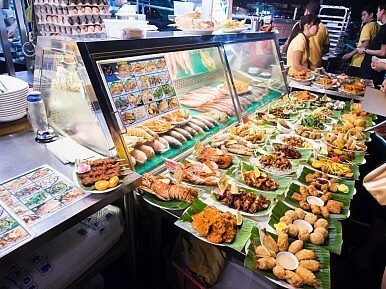 Customers in Singapore are considered to be open to a wide range of foreign concept foods, conscious of food safety and health, and aware of sustainable products. However, they are not necessarily willing to pay more for them. In 2013, the U.S. exported retail food products to Singapore worth approximately $575 million, making tiny Singapore its 13th largest market. Exports were led by dairy, prepared foods, fresh fruits, and pork products. For Australia, Singapore was its 9th largest market for food, beverage and agribusiness products in 2014, with exports of A$1.1 billion ($760 million) the same year, principally animal fats, dairy products, red meats, sugars and sugar confectionery and pork. Direct imports are not the only reason for Singapore’s international relevance. Its location and trading hub status makes it a vital market for exporters. For example, the percentage of imported food that is re-exported to other countries is approximately 20-25 percent. From a policy perspective, Singapore has managed to accomplish the difficult task of becoming a food secure country by boosting the resilience of its food supply. Policy alternatives such as diversification of sources, the Food Fund, and facilitating food imports are all important components of a well planned and coordinated strategy. Nonetheless, the next 50 years are likely to be more complex as alternative possibilities depend on external forces and are subject to global change over which the city-state will have no control. Globally, increasing resilience has been acknowledged as an effective strategy against fluctuations in supplies. This encompasses partnerships, financing, trade, technology, and research and development, all of which are already part of Singapore’s strategy. What else can the city-state do? One alternative is to reduce food waste. Another would be to continue investing in innovative food science and emerging technologies. High-tech, visitor-friendly urban agriculture on the East Coast, or even in very fashionable 50-plus story buildings designed by the nation’s most innovative architects could be very significant options. Highly sophisticated greenhouses that control their environments (temperature, carbon dioxide levels, air flow and nutrients) and situated on ships adapted for this purpose could be another alternative. Projects as visionary as the Marina Reservoir (with a catchment that is about one-sixth the size of Singapore’s total land area) or as innovative as Pulau Semakau (the world’s first offshore landfill) for highly intensive agriculture could represent additional possibilities. Agricultural investment or contract farming abroad – something that other countries, financial services, life insurance, and pension schemes have done – is a distinct possibility. Stable nations such as Australia, the United States, or Brazil may provide attractive business possibilities. Singapore continues to develop its food security strategies, seeking opportunities and addressing risks in an increasingly complex environment. One relevant lesson that other Asian countries could learn from the city-state is the understanding that food security does not mean food self-sufficiency, since no country can be self-sufficient in all food products. National food security depends on both domestic production and imports, and requires effective distribution, in addition to diversification, partnerships, and good long-term planning. These are the reasons why Singapore, which imports most of its food, has become the second-most food secure country in the world. Dr Cecilia Tortajada is Senior Research Fellow at the Institute of Water Policy, Lee Kuan Yew School of Public Policy, National University of Singapore. Mr Thinesh Kumar S/O Paramasilvam is student in Geography at the same university.